Happy Monday everyone. Big news! 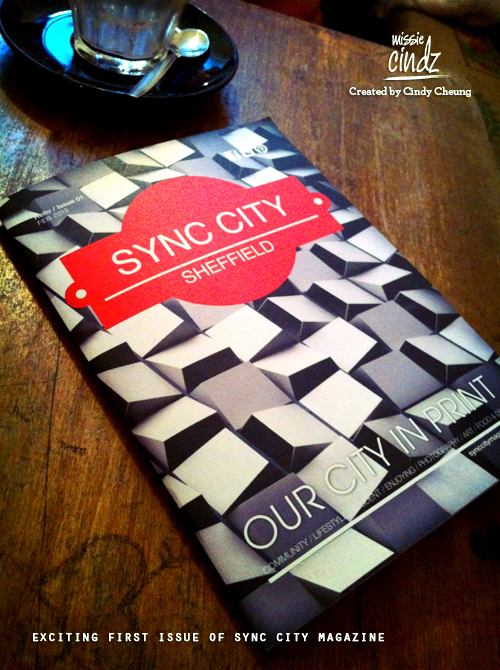 I’m extremely happy to report that the new Sync City Sheffield magazine I’ve been working so hard on over the last months with the Sync City team is now live. Yep, an entire magazine dedicated entirely to all things Sheffield. Issue One is available in Sheffield (for a full list of outlets to pick your copy see here) and it kicks off with a ‘Ten Things to Love About Sheffield’, plus regular real-life reads such as “A day in the life of…” – with this month featuring an interview with Nicola Shutt, a neuro nurse from the Royal Hallamshire Hospital, and ends on an interview with Sheffield’s World Champion Mountain biker Steve Peat! Yay! Yes, it’s a roasted Halloumi-Henderson’s Relish magazine sandwich, sprinkled with inspirational stories, stunning photography of Sheffield from local residents and lots of nice things to look at and do. If you’re as passionate about all things Sheffield-like and making a contribution to building a more positive community as much as we are then I really do hope you’ll check out the first issue. And by all means, do let the magazine’s Editor, Kat Buck know if you’ve got any ideas, topics, and writers that you’d like to see in coming issues by emailing to the Editor.